SOMEONE TO HEAR ME, a book by author and educator EBONY JOY WILKINS, Ph.D. 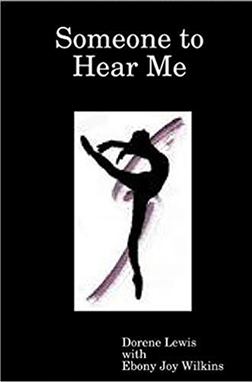 Someone to Hear Me is a personal account of how Dorene Lewis survives daily abusive relationships and finds the strength to make drastic life-style changes to better her life and the lives of her children. 1. If a friend tells you they are in an unhealthy relationship and they need help, how do you respond? What do you do? 2. The relationship you are in no longer works for you but you don’t know how to leave it. What do you do? Who can you call? 3. At school, you are popular and involved in several groups on campus, but feel depressed and uninterested. How can you ask for help? What do you wish the people around you knew? 4. Your counselors, teachers, family and friends are helping you to manage your anxiety. Now, they are asking you to help others by sharing your story. What do you write? Who do you hope reads your story?